Today I take on the first of three films I'll be watching by Makoto Shinkai: 5 Centimeters per Second. It's a romantic drama centering around Takaki and Akari as they go through life. It's separated into three acts during different times of their lives. First thing's first, the style in animation and storytelling is Makoto Shinkai's motif. It's a deeply introspective and dramatic look at this story of two people as they go through life. It eschews pretty much every trope that is normally exploited in anime. This film is held in high regard by audiences and critics (just as his other two films are) for its incredibly heart-breaking and yet utterly beautiful romance story. The movie completely rejects all of the usual tropes that you've come to expect from anime and romantic media like this. The animation doesn't even stray into ridiculous for a second and there aren't any prominent romance tropes that you'd expect either. In this way, it catches you very off-guard and smashes your expectations. It's also a very slow-paced movie that opts to trace the lives of these characters over the long-term. It explores the characters to an almost incredible extent and you really get a feel for what these characters are thinking. You'll notice a labyrinth of rich subtext and metaphors embedded deep into this film. Everything from the way that scenes play out (the rocket launch) to the cherry blossoms are used to convey veiled messages to the viewer in a beautiful manner. It's pretty incredible to watch. The movie takes an almost ridiculously introspective look at how life and the ideal romantic plot are not the same in any way. Each act has a way of turning romantic tropes on their head that is admirable and saddening to see at the same time. It slowly tells a romance story that is completely heartbreaking and it has no shame in doing it. Partially because of this and partially because of the animation, this movie is packed with moments that you'll fondly remember. It'll probably be memorable for the beautiful animation, rich storytelling metaphors, or just how heartbreaking or heartwarming the scene is portrayed. An aside, the animation is beautiful. It really is. 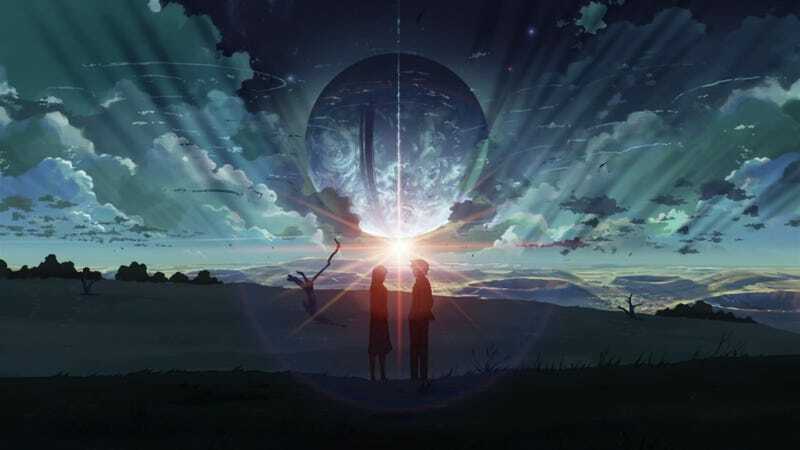 A definite thing that will grind on new viewers is Makoto Shinkai's style of storytelling. While it is beautiful and excellently written, the story is heartbreaking, depressing, and slow. It's very clearly a character drama that leaks depression at every turn. You'll be hard pressed to find a moment in the movie where there isn't something depressing happening. Let's be honest though, even the biggest fans of this movie will agree that it is extremely slow. Its main quality as a movie is managing to tell a deep believable story about love and how life can have an effect on it. This movie isn't the sort of thing that you watch if you wanted anything particularly groundbreaking or fast-paced. It takes its time. At its core, 5 Centimeters per Second is a metaphor-packed character drama revolving around the lives of two people. It can be incredibly depressing and heartbreaking at times, and yet it also has genuine moments of heartwarming mixed in too. It tells a very beautiful romance story that avoids tropes that we commonly associate with the romance genre. It's animation style is beautiful as it shows us the backdrops for the series and the characters themselves. There are a number of moments in the series that everyone will remember for being amazingly animated and metaphorically brilliant. There's a lot of love here, but it also will be bad for some because Makoto Shinkai's trademark storytelling style. The story is told at a very slow pace and opts to be extremely introspective as it explores its characters. There's no action or humor, it's just a relentlessly depressing character drama. Because of how heartbreaking and depressing the series is, this is a movie that you should avoid on your bad days. This is best for someone that wants to see an introspective romance movie that ignores the usual romantic genre tropes. Anyone else will likely be disappointed. There's not much else to say, you can expect the other two movies to be similarly short reviews. There isn't very much I can talk about. You can watch 5 Centimeters per Second on Crunchyroll. I think we can count on Evangelion 3.0, Robotics;Notes, or Walkure Romanze next time.